"Dr. Hariri is awesome and kind, and his staff are professional, courteous and efficient,"
"Dr. Hariri is knowledgeable, caring and a good listener." "Dr. Hariri is a very genuine doctor who is very interested in his patients' health..."
"Smartest and truly nicest doctor I have seen in years!" "Dr. Hariri is one of the best doctors in Beverly Hills." "This doctor is the absolute best. He treated us like family every step of the way." "He took his time and explained everything to me very well!" "I can't recommend Dr. Hariri enough!" "Dr. Sherwin and his team were more than phenomenal." 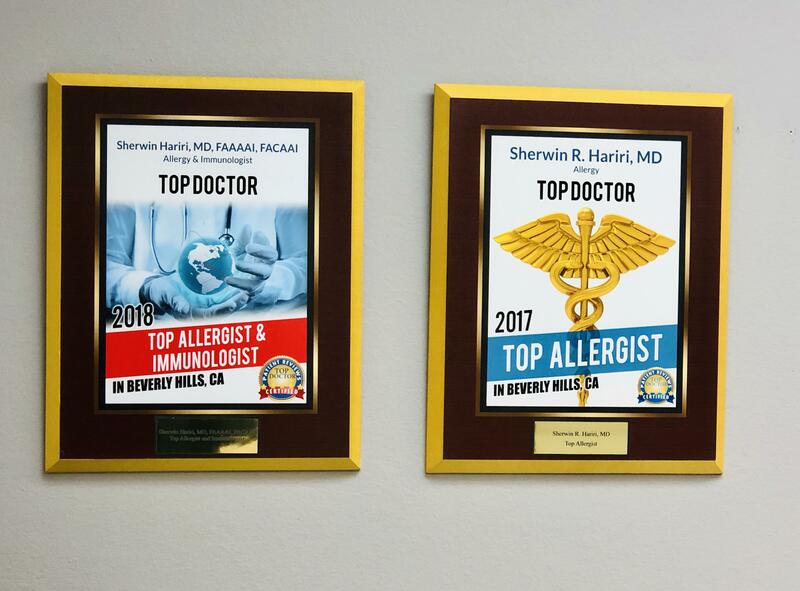 Dr. Sherwin Hariri is a board-certified adult and pediatric allergist and immunologist serving patients in Beverly Hills and the greater Los Angeles, CA area. He specializes in both adult and pediatric patients with asthma, allergic rhinitis, allergic conjunctivitis, sinusitis, history of food allergies, drug allergies, immune deficiencies, eczema and other allergic skin rashes. "Best of Beverly Hills Award" winner Dr. Sherwin Hariri is opening his brand new space in the Heart of 90210 in the Golden Triangle, only steps from world-renowned Rodeo Drive. Dr. Hariri is also an allergy and immunology attending Physician at Cedars-Sinai, where he sees patients with complicated allergic diseases. At Beverly Hills Allergy, we strive to help you breathe better so you can live better. Dr. Hariri attended Saint Louis University School of Medicine, after which he completed an internship at the Harbor-UCLA Medical Center. He then went on to complete a residency in Internal Medicine at the world-renowned Cedars-Sinai Medical Center in Los Angeles, California. After his residency, he went on to teach residents at Cedars-Sinai Medical Center (where he still teaches residents) and the West-LA VA Medical Center (a UCLA-affiliated hospital) as an academic hospitalist. He then decided to specialize in a condition that has always been his passion: Allergies. Dr. Hariri completed his fellowship in allergy and immunology at the prestigious UCLA West-LA VA program with pediatric rotations at the world-class Children's Hospital in Los Angeles (CHLA). Dual board-Certified by both the American Board of Allergy and Immunology and the American Board of Internal Medicine, Dr. Hariri is an expert in treating both adult and pediatric allergic and immunologic diseases. He is currently a clinical instructor at the West-LA VA Allergy & immunology clinic, where he teaches fellows (Doctors training to be allergy & immunology specialists) and internal medicine residents (physicians-in-training). Dr. Hariri is a Fellow of the American Academy of allergy, asthma and immunology and the American College Of Allergy, Asthma, Immunology. Dr. Hariri holds privileges at Cedars-Sinai Medical Center. Dr. Hariri is often consulted by other physicians to see their patients who are hospitalized with severe and complicated allergic and immunologic conditions. Dr. Hariri performs comprehensive skin testing for aeroallergens (such as grasses, trees, weeds, molds, dust mites, and pet dander) and all kinds of foods. He offers immunotherapy to those who are looking for a potential cure for their allergic symptoms. The doctor also performs a very comprehensive patch test for delayed hypersensitivity to all kinds of chemicals, metals and dyes causing different types of skin rashes in his patients. Oral food and drug challenges are also performed in his office as well as spirometry to test lung function in asthma patients. Dr. Hariri was voted to "Super Doctors® Rising Stars ℠" as recognized in a special publication distributed with Los Angeles Magazine in 2017. After a vigorous multistep selection process of physicians who have attained a high degree of peer recognition and professional achievement, Dr. Hariri was voted to the "Super Doctors® Rising Stars ℠" list for 2017. "Very caring and knowledgable Doctor! He really knows how to treat allergies. Beautiful office btw!" "Genuine and very helpful! Staff is professional and I only had to wait 5 minutes to see the doctor." "Dr. Hariri is a very genuine doctor who is very interested in his patients' health and answers any questions you might have so that you feel comfortable." "Competency. Compassion. Respect. Altruism. Four distinct traits that truly encompass Dr. Sherwin Hariri and his practice." "Dr. Hariri is a very compassionate doctor. He took his time and explained everything to me very well! I highly recommend him to all my family and friends!" "His office looked very nice and elegant. I was able to get into his clinic immediately and the waiting time to be seen was very short." "Very knowledgable about food allergies. Within 15 min he figured out what I'm allergic to and testing was painless. Highly recommend." "Dr. Hariri was so helpful in my understanding of my seasonal allergies. He took great care of me and I would enthusiastically recommend him to anyone." "Doctor Hariri is the BEST!!! He is a true life saver! He is compassionate and smart. I finally found a Doctor who knows how to treat my eczema!" "He is awesome and really cares about the overall health of his patients. He also has a great assistant!" "I would highly recommend Dr. Sherwin in the future to friends and family members who are seeking the assistance of an allergist in the greater Los Angeles area." "I always feel cared for whenever I go to this practice. The doctor is very nice and genuinely cares for his patients. Sabrina is always pleasant and helpful as well." "I have seen many allergists in the past, and finally I walked into an office where I truly felt the doctor was not only brilliant, but also cared to listen to me." "Dr. Hariri is the best. He definitely cares about his patients and will go above and beyond. Thank you Dr. Hariri for your amazing help and guidance!" "Dr. Hariri is a genuine doctor who cares about his patients. He is very knowledgeable and smart. Thank you Dr. Hariri for everything!"